Search templates (or search screens ) in Wolf PaaS allow the User to filter the available records and to find relevant records in his web app. 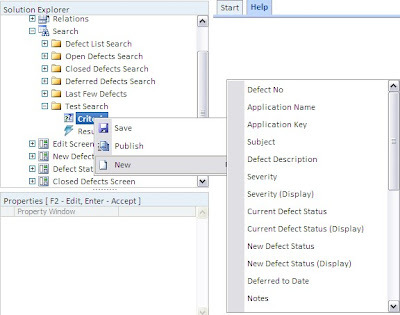 Consider a scenario in which a Tester using the Defect Tracker requires to find all Defects(records) having a "High" severity. 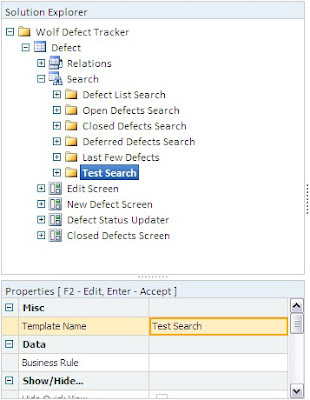 The Tester simply enters the search parameter in the "Search By" option and presses the "Find Now" to generate the relevant defects. Additionally, the User may also filter the records using a combination of multiple parameters . 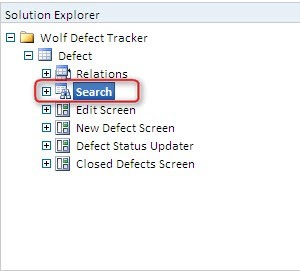 Lets take a look at basics of creating these Search Templates in the Wolf web based application Designer . When a user creates a new Entity, by default a "Search" option is provided among the Entity elements. This option enables the designing of custom Search templates . As the first step, the User needs to Right-click on the "Search" button and then choose "New Search Template". Doing so would automatically create a Search screen for the User with the "Criteria" and "Results" node. It is important to note that the search screen is always associated with the fields defined in the Entity under which it exists. (Fields are defined in the Edit Screen). The User may then define the properties of the template such as the name of the template , its behaviour, etc. as per his requirements. For the sake of simplicity, we limit ourselves to the task of giving a name to the template, say "Test Search". The "Criteria" option is used for specifying the key fields which will be used as a criteria for searching the records. The user may include any number of fields which he desires to use as a criteria for filtering his records. The "Results" option is used for specifying the fields of the filtered records which will appear in the results table. For specifying the criteria, the User needs only to right click on the "Criteria" option and add the fields which he desires to use as the search criteria. The user can specify multiple fields as per requirements. A similar technique is used for selecting the fields which the User wishes to display in the results . There is an array of options available in Wolf for further customization of Search templates, which are not discussed here for the sake of simplicity. Once the User is done with designing his search template, the next step is to associate this search template with a Navigation Menu item. 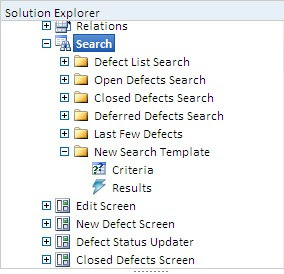 This menu item provides access to the newly created search screen in the "Run" environment of the application. The User decides which of his web app users need to be given access to this newly created menu item and provides the access to them accordingly. That's it... the User can now run his application and use this search template for filtering his data. I'll discuss more about the flexibility of the Search templates in a later post.